Lizzie with Rotary District Governor Keith Roffey in Sydney. We’re very happy to announce that Lizzie was presented with a Rotary International award for her work in Ethiopia at the Foundation’s annual dinner in Sydney recently. Lizzie spoke on the night about Botanica Ethiopia, her research and involvement with the Fiche community over the last three years. Money raised will be used to buy wheelbarrows, watering cans and hand tools for the newly formed ‘Etse Fewus’ medicinal garden Association, in Fiche, Ethiopia, which Lizzie will be visiting next year. Botanica Ethiopia: A living Pharmacy (J655N) is an approved development project of Australian NGO Global Development Group (GDG). Sponsor $1 for each gruelling kilometre! Go to the Botanica Ethiopia Fundraising page here. For more info about the 2012 Blackmores Sydney Running Festival click here. As the car made its way out of the dust of Addis on the climb up the wooded Entoto Mountain, we could breathe the clean sharp air of the countryside on our journey to Fitche, about 2 ½ hours’ drive north through incredible scenery, now quite familiar to me and something to which I had been greatly looking forward. What I was not looking forward to was embarking on another hair-raising dodgem-car ride, narrowly avoiding the “Al-Quaeda” (as they are dubbed locally) trucks and crazy minibus drivers. Oh yes, I remembered this bit, and it is sobering to see the number of overturned minibuses and semitrailers by the side of the road. But we made it thanks to Lakew’s skill at the wheel and pulled up at the Doyu-Armon Garden, now proudly sporting an entrance gate made from eucalyptus saplings, and mounds of red soil and sand ready to be ploughed in. As I had been warned, the clay soil was cracking in the intense dry heat, threatening to crush the tender rootlets of the new plants. Lakew said that his job over the next few days was to supervise the filling of a long stone-edged trench with the good soil so that the most vulnerable plants can be transferred until they are strong enough to survive. Abiyu and Lakew showed us the line of Set eret (Aloe pulcherrima), surviving but looking a little burnt at the edges, and Tefrindo (Gomphocarpus purpurescens) looking quite happy. Abiyu showed us the sap from the Tefrindo and explained how it is used to paint on warts. Another area sported the erect pointed leaves of Wonde cheret (Sanseviera ehrenbegii), used for ear infections. We were shown other plants, looking a little straggly but protected with straw, and, with some concern, an empty borehole. Lakew is onto it, arranging to have it dug deeper. Abiyu tells me that if the plants can be nurtured along to survive a year, they will be strong enough to flourish and cope with both wet and dry seasons. So, progress has been made but we have some work still to do in getting the conditions right. We checked in to the Abiido International Hotel. Disappointing to find that the bath didn’t work but the trickle of hot water from the shower was a surprise bonus and quite adequate to remove the dust of the drive and reinvigorate some stamina. Heading to Shikerker’s house, I couldn’t wait to meet up with the community members who had been so generous with their herbal information for my research and it was a fun reunion. Of course they asked where daughter May and son Alemayehu were and I had to explain that the travelling team has shrunk a little this time, but they were happy to meet Kristin who was in charge of both the film camera and (even more importantly) containing my (and Lakew’s) enthusiasm to keep us on strict track. That woman has impressive skills and increasingly I realise how much I need her to keep this project aligned with objectives and being the voice of experienced caution. Although I have to confess to that heart-sinking moment when she says (as she so often did) “Yes, Lizzie, but are you considering..?” and I was glad to see Lakew looking equally crestfallen as he is worse than I am in the Big Idea stakes. Last week we met with Tessema Bekele, the Ethiopian founder and now Executive Director of the NGO Emmanuel Development Association. Tessema told us his inspirational story of starting from humble beginnings with a small project idea, to what is today management of a large number of highly successful projects with international funding and support. The focus is on marginalised youth, school dropouts, orphans and business skills training, as well as helping to empower women, who are a marginalised group in themselves. I asked Tessema what led him on this journey. “My father, a Coptic Orthodox priest, died when I was very young. My mother had to look after me, my sister and brother and it was very difficult. I was lucky enough to be sent to priest school. One day, I was running home from school and I hurt myself, cutting my toe. My mother is cleaning it for me, and she says; ‘My son,your father wanted you to be successful. He died three years ago, Tessema, do not be discouraged. You see those children who are your neighbours, they are 11 and 12 years old and they have not gone to school. You are six, and you go to school. You must work hard and help others.” This was his inspiration. He went to university, and after working some time in the air force, he went to work for World Vision. In 1996 he applied to the government to set up a charity, and after some discouragement (his plans were considered too ambitious), he was eventually given a licence. Today the Emmanuel Development Association has grown to provide education to 146,000 children in Ethiopia, establishing 40 junior primary schools and 8 elementary secondary schools. It relies on 175 office staff (volunteers from overseas), 75 local professionals and 4 project officers. The Association has handed over 25 schools to the government, which uses the education template they have set up. In addition to education, they’re involved in alternative energy programs, urban “trash to cash” projects and microfinancing to women’s groups. 2,750 marginalised women are now engaged in co-operatives and business activities. When I asked his views of the Botanica Ethiopia project Tessema was very encouraging. “We were small when we started…this is a good and important project,” he said. He emphasised the importance of engaging community, something which is a major aim of Botanica Ethiopia, in order to sustain project benefits well into the future. Tessema’s story is one of optimism; we have much to learn from his experiences – not only how to do things, but more importantly, how to avoid some of the mistakes that can easily be made by those who are well-intentioned but sometimes lacking in experience and local knowledge. It is a good story of a local who has had vision and enterprise, not to speak of persistence, in overcoming the difficulties and pitfalls which can stand in the way of a good project. And for the Botanica Ethiopia project, some useful and pertinent advice. 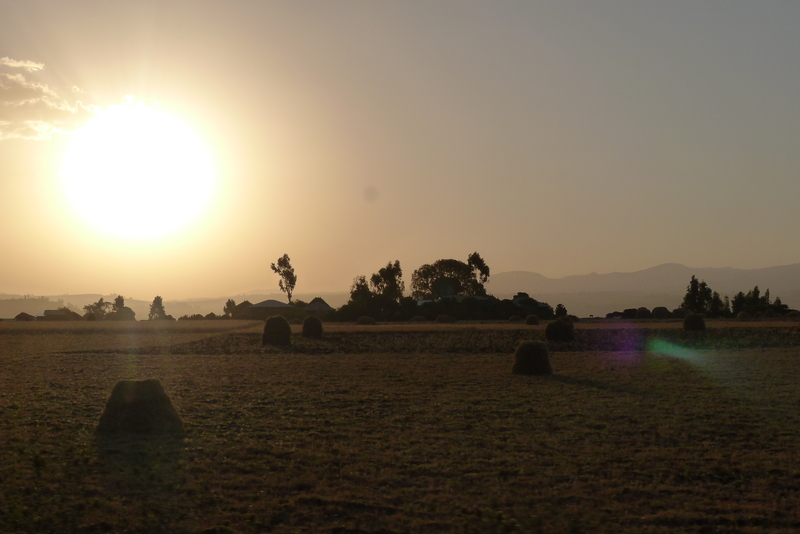 Lizzie shares her first few days back in Ethiopia with the Living Pharmacy project. Stepping out from the sanitised chill of the airplane into everything that is Addis Ababa, feeling the thrill of returning here mixed with anxious anticipation of all that we hope to achieve in this second visit for Botanica Ethiopia; this is the start of another journey. I am travelling this time on my own from Australia, but met up in Dubai for a connecting flight to Addis with Kristin Gomes, a multi-skilled and multi-talented aid worker from America who has volunteered to spend a month with me overseeing the activities and bringing her wealth of knowledge to bear on the project. Kristin also has the task of being Director of Photography with the filmwork documenting our progress. We hit the ground running. Once we had settled into the guest house in the city, we set out to orientate ourselves. This is my fourth visit, the Amharic language is coming back to me and is always useful to create a bit of hilarity wherever I go. The sounds, the images, comfortingly familiar; this means I can get to work the next day quickly without too much distraction. A few telephone calls later, some meetings arranged, and a quick email back home to the family to let them know of our safe arrival. My first meeting was with Dr. Zemede Asfaw of Addis Ababa University, who helped to supervise my research at Fiche. Warm reunion greetings over, Dr. Zemede introduced me to Abiyu Enew, the postgraduate student in Ethnobotany whom he is supervising to replicate my research and to conduct a wider ethnobotanical survey of the area. Abiyu has done a great job, collecting specimens of many plants in the area for depositing in the herbarium at the University. We arranged for Abiyu to join us on our trip to Fiche in a couple of days’ time where we will be talking to the women householders and to the herbalists to gauge their interest in establishing household herbal gardens. We will be visiting the main Doyu-Armon garden to see the herbs that have been planted and to see Lakew’s work in improving the soil to support their growth. Dr. Zemede also introduced me to a doctorate student from Cornell University in the States who is conducting agroforestry research in the northern part of Ethiopia. Every time we meet with people here, more possibilities arise for Botanica Ethiopia and it is my job, and Kristin’s, to ensure that we stay on track in getting the fundamentals right. Kristin’s words of caution come from experience: “Lizzie, all these ideas are wonderful possibilities. Now, put them on the shelf ready to bring down later…” This is good advice – a major focus of this trip is to make sure that what we are doing is sustainable, and to do that a solid foundation has to be built. We are well on the way. Our second meeting was with Lakew to organise our field trip to Fiche. We will travel there on Tuesday to spend a few days with the householders and herbalists, to determine their interest in developing individual household herbal gardens and to see how we can support them to do that. Team Botanica Ethiopia ran like the wind on Sunday; We all crossed the finish line at the Blackmores Sydney Running Festival in under an hour! It was a sunny spring morning as we joined some 35,000 other runners over the Sydney Harbour Bridge, through the city and down to the Opera House Quays. The choppers were out early; we were cheered by spectators, drummers and placards along the route; “Got stamina? Call me!” It was a fun day. And we even got a photo with a champion – The Ethiopian winner of the Women’s Marathon, Letay Hadish! Thank you to all those who so generously sponsored us. We raised a total of $800 which will help pay for permaculture training and advice for the medicinal herb garden in Fiche, Ethiopia. Stay tuned to the blog to see how the garden project is growing. We’ve also passed on $100 raised through the event to the UNHCR East-Africa Crisis Fund.